[JAN. 14, 2002] All high school juniors and seniors who are interested in learning more about Lincoln Christian College are invited to come visit the LCC campus on March 3. Registration begins at 9:30 a.m. in the Warehouse (student center). Please RSVP by Monday, Feb. 24. Call (217) 732-3168, Ext. 2228 or respond by e-mail to coladmis@lccs.edu. [JAN. 23, 2003] In competition at Heyworth on Jan. 18, the speech team from Lincoln Community High School placed first. "First place at such a large tournament just emphasizes the first-rate competitors that we have on the team this year," said Ed Jodlowski, a coach for the Lincoln students. "With the state series looming, the sky is the limit." 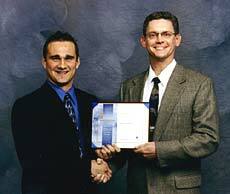 [JAN. 21, 2003] URBANA -- Kent D. Leesman of Atlanta is a recipient of the Jonathan Baldwin Turner Scholarship. He was honored during a Dec. 13, 2002, banquet at the Illini Union on the Urbana campus of the University of Illinois. Leesman is majoring in crop sciences. After college he plans to return home to manage the family farm and become a Pioneer dealer and agronomist. His JBT Scholarship is funded by Pioneer Hi-Bred International, a DuPont company. He graduated from Hartsburg-Emden High School and is the son of Kevin and Joyce Leesman. The University of Illinois College of Agricultural, Consumer and Environmental Sciences established the JBT Scholarship program to recognize high school students who have demonstrated academic excellence, good citizenship and leadership skills. Jonathan Baldwin Turner, a pioneer of agricultural education in Illinois and the nation, epitomized the spirit and intent of the scholarships bearing his name. A noted farmer and lecturer associated with Illinois College during the mid-1800s, Turner envisioned a nationwide system of educational institutions providing a "liberal and practical education" for citizens in the areas of agriculture and the mechanical arts. This year, 54 high school students of diverse social background and geographic origins were awarded a JBT Scholarship, marking the 24th anniversary of the program. Over $800,000 in merit-based scholarships was awarded to students in the College of ACES in the 2001-02 academic year. The mission of the college is to enhance the quality of life of rural and urban people through teaching, research and outreach programs focused on human activity, food, fiber and natural resource systems. [JAN. 21, 2003] Applications for the Dwight F. Zimmerman Scholarship, sponsored by the Abraham Lincoln Healthcare Foundation, are currently available. Applicants must be graduating seniors from Lincoln Community High School, Mount Pulaski High School, Olympia High School, Hartsburg-Emden High School, Delavan Community High School, Illini Central High School or students currently attending Lincoln College. All applicants who are chosen as finalists to interview with the scholarship selection committee will receive an award to be applied directly toward tuition, fees and books. The two top applicants will receive scholarships of $1,500. Other finalists will be awarded $500 scholarships. Applications are available in the guidance offices of the above-listed schools. Applications are to be submitted to the Abraham Lincoln Healthcare Foundation, 315 Eighth St., Lincoln, IL 62656. The deadline to submit an application for the Zimmerman Scholarship is April 4. For more information, call the foundation office, (217) 732-2161, Ext. 405. 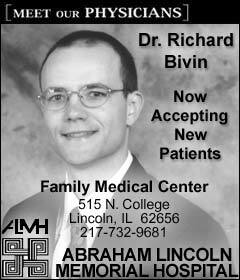 People who wish to contribute to the scholarship fund may send their contributions to the Abraham Lincoln Healthcare Foundation, 315 Eighth St., Lincoln, IL 62656. [JAN. 20, 2003] The Zonta Club of Lincoln again will sponsor health career scholarships for residents of Logan County who are enrolled in or accepted to a health care professional curriculum. The scholarship award is for one academic year and is contingent upon the student's sustained academic achievement. Former recipients may reapply. Application forms are available by request at the high schools in Logan County, ALMH, several long-term care facilities and pharmacies in the county. All completed applications, including references, are due to the scholarship committee by March 10 to be considered for interview. For applications and information, contact Mary Bruns, 778 Prairie St, Lincoln, IL 62656. [JAN. 17, 2003] State Bank of Lincoln announces a scholarship competition that enables Illinois high school seniors to enter a statewide essay-writing contest. The bank is working with Lincoln Community High School, Mount Pulaski High School, Hartsburg-Emden High School and Olympia High School to invite seniors to submit short essays on the theme: "Does technology help or hinder the philosophy of community banking? Why?" The scholarship competition is part of a program sponsored by Illinois community banks and the CBAI Foundation for Community Banking to increase public awareness of locally owned banks and their contributions to the community. State Bank of Lincoln is a member of the Community Bankers Association of Illinois, which formed the foundation in 1996. A scholarship in the amount of $1,000 a year for up to four years of higher education will be awarded to the author of the best essay submitted to the CBAI Foundation from participating Illinois high school seniors. Up to 12 additional $1,000 awards are available in each of the regions of the state. An additional $500 will be awarded to the high school of the overall winner. William M. Hull, executive vice president stated, "Any high school senior student in the area served by the bank is encouraged to participate. Four past regional winners have been submitted to the CBAI by the bank. Winners were from Lincoln Community High School and Mount Pulaski High School." Entries must be submitted to the bank by 5 p.m. on Feb. 10. The bank will then submit selected entries to the CBAI Foundation to be eligible for the statewide competition. Information on the contest is available at the bank, through William Hull, at the schools and at http://www.cbai.com/schannual.htm. Based in Springfield, CBAI is a professional association that represents approximately 520 banks and thrifts throughout Illinois. [JAN. 2, 2003] BLOOMINGTON -- To commemorate the 25th anniversary of the Bloomington-Normal basketball tournament (now known as the State Farm Holiday Classic) in 2003, the Classic Organizing Group is establishing a scholarship fund. The announcement was made Wednesday evening at Illinois Wesleyan University's Shirk Center on championship day of the 2002 State Farm Holiday Classic. The scholarship fund, known as the Classic Organizing Group Scholarship Fund, will award four scholarships to eligible students from the 64 participating teams at the 2003 State Farm Holiday Classic. The scholarships will be awarded to two boys -- one from a McLean County school and one from a school outside McLean County -- and to two girls -- also one from a McLean County school and one from a school outside McLean County. The first recipients will be introduced during the final night of the tournament next December. All senior students from the participating schools will be eligible for the scholarship. The Classic Organizing Group is currently developing guidelines and will announce them to the participating schools early in the fall. "We feel this is a great way to give back to the students and schools that have helped us grow our tournament in the past 24 years," said Dan Highland, president of the organizers. "When this tournament started, I don't think the organizers knew it would ever grow into the largest coed holiday basketball tournament in the nation. We just want to keep building onto the illustrious tradition with this tournament." Highland said next year's awarding of the four scholarships will begin a new tradition with the tournament. "We'll start with four next year, with a goal to increase scholarships in the future," he said. "We're not just providing the 'Best Basketball this side of March,' but we want to advance the educational opportunities to students who don't have the full financial resources to attend a community college or four-year school." The Classic Organizing Group Scholarship Fund has been established through the Community Foundation of McLean County, a not-for-profit 501(c)3 organization. Donations made to the fund are tax-deductible. The Classic Organizing Group has other special activities in store to commemorate the 25th anniversary of the tournament. More details will be released in the fall. For more information about the Classic Organizing Group or the State Farm Holiday Classic, visit the official tournament website, www.theclassic.org. [DEC. 5, 2002] The General Federation of Women's Clubs has announced a number of scholarships available for students planning to attend Illinois colleges or vocational schools during the 2003-2004 school year. Included in the list are the Arthur Grant Smith Drama Scholarship, $300; the GFWC Illinois Centennial Library Science Scholarship, $300; the Hamilton Ridge Music Scholarship, $500; Illinois Cottage Park Ridge Vocational Scholarship for Girls, $500; the Lincoln Lodge Vocational Scholarship for Boys, $500; and the Lorado Taft Art Scholarship, $500. The Vina A. Miller Memorial Scholarship, $500, is also being offered to students planning to make the field of public affairs their career. Vocations in the field of public affairs include the study of crime prevention, life safety, fire, police, historical preservation and veterans affairs. A new scholarship being offered by the GFWC Illinois Federation of Women's Clubs for the coming year is the Illinois Cultural Exchange Student Scholarship for students planning to study abroad. Students for all of these scholarships must be Illinois residents attending an Illinois school. Winners will notified by May 1, 2003, and scholarship funds will be disbursed to the college financial aid office after verification of student registration is received at the Illinois GFWC headquarters. Applications for these scholarships are available from the guidance department at Lincoln Community High School or may be requested by sending a self-addressed, stamped envelope to Lincoln Junior Woman's Club Scholarship Chairman Judy Rader at 132 11th St., Lincoln, IL 62656. Completed applications must be returned to Rader no later than Feb. 8, 2003. [NOV. 26, 2002] The ESA Foundation of Epsilon Sigma Alpha International, a women's leadership organization, is announcing the availability of scholarships for college-bound high school seniors, college students, trade school-bound students, as well as nontraditional students. To find out more about Epsilon Sigma Alpha International, visits the website: www.esaintl.org.